See also Legolas Codex Stencil by Frodo7. This is another variation to the Legolas theme: combining medieval codex lettering with contemporary constructive minimalism. Thus, the upper case look and feel somewhat unadorned compared to some classic blackletter capitals. Yet, the glyphs seem to work nicely together even in long body of text. Info: Created on 17th May 2009 . Last edited on 8th January 2012. 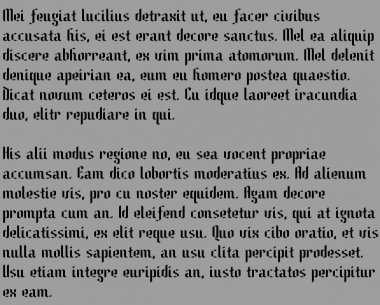 This is an example to show how this typeface would look when used with longer body of text. Very nice. I love the g.
Congratulations! FontStruct Staff have deemed your FontStruction worthy of special mention. “Legolas Codex” is now a Top Pick. But some details feel a bit weird to me. The basic construction suggests a broad nib pen ( o n h m i k $ ), but many details contradict this model – for example the contrast angle in d is flipped, a b q have weight both at the top and at the bottom of the bowls (compare with b d), v and w are different. Thank you gferreira. Very kind of you. And it's never too late. The Legolas series was the apple of my eye. It had been conceived now many years ago, when I was experimenting with the true triangular grid. It looks even better with 60° angles. The issues you've raised are largely unintentional, and come out of the constrains of such geometry. But I'll think about it again. Just to remind you, tomorrow is 22nd September. You all know what day it is. @p2pnut: It was close. September 22nd, 1290 (by Shire reckoning) is the birthday of Bilbo Baggins (Book One, Chapter I, The Fellowship of the Ring by J.R.R. Tolkien).